Support JitterbugJive on Ko-fi.com! - Ko-fi ❤️ Where creators get paid by fans, with a 'Buy Me a Coffee' button. I'm JitterbugJive, also known as BaldDumboRat. I'm an artist who has multiple ask blogs on tumblr, along with a webcomic. 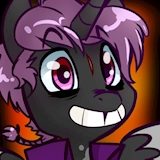 I also direct a radio play fan series where I also play one of the main characters.br/You may know me for Discord Whooves, Lovestruck Derpy, or Doctor Whooves and Assistant. Secured Payments. Support goes to JitterbugJive's account.